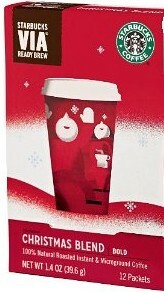 Available for the start of the 2010 holiday season is Starbucks Christmas Blend VIA. Made from coffee from Latin America, Aged Sumatra, and Asian/Pacific coffee. Considered a sweet and spicy blend – a Starbucks classic.